Sophomore Mason Adams is a starting pitcher for the Lebanon High School Junior Varsity baseball team, but there's one thing that's different about him. 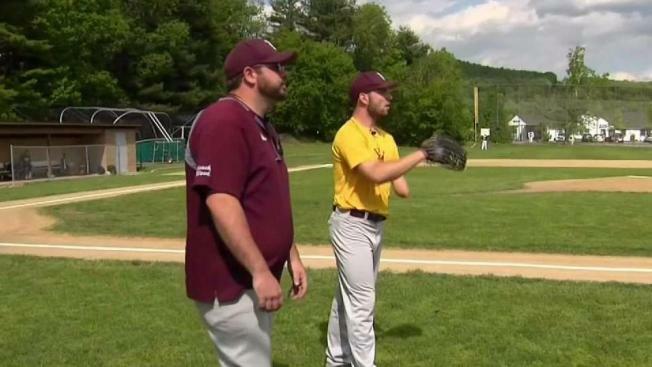 He was born without a left forearm, but he says it's made him a better person and he hopes his message will go far beyond the baseball field. Lebanon High School Junior Varsity Baseball Coach Chauncey Wood admits there’s something different about his starting pitcher. “He works harder than most,” Wood said. And apparently, his starting pitcher also throws harder than most. “Definitely hurts my hands sometimes, I’m not going to lie,” said the team’s catcher Calvin Bates. Other than that though, Mason Adams’ teammates see no difference. “Mason’s able to keep up on his own, so there’s no reason to,” said player Cooper Bourne. But if you look closely at Adams, you’ll notice something’s missing. “The only thing different about me, is I am not using two hands, I am out there with one,” Adams said. He was born without a left forearm and since his tee-ball days, he’s been perfecting his form. The Lebanon High School sophomore now plays three different positions on the JV team and has earned the role of captain. “I’ve always wanted people to look at me the exact same way as they’d look at themselves,” Adams said. But he admits it’s not always that easy. Having one hand, Adams says, isn’t an obstacle you overcome, it’s a challenge you learn to live with. He says it’s made him a better person, and he hopes his message goes far beyond the baseball field. “If you want something that bad you can go out there and get it one way or the other,” Adams said. “Hopefully, somebody gets the encouragement to follow through with something they didn’t think they could do, because this kid has done everything he’s wanted to do,” said Coach Wood. As soon as baseball season is over, Adams is on to the next sport. He starts summer hockey at the end of June.